The Elephantnose Fish, or Peter's Elephant, are very unique fish that not many hobbyists can say they have. Elephantnose Fish are thin and oblong, primarily dark brown or gray with white markings and a long trunk-like nose, thus the name, elephantnose. 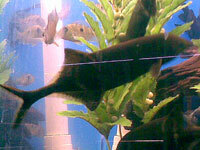 Elephantnose Fish are shy, sensitive fish, who need pristine water conditions to thrive. They are, in fact, so delicate, that they are used at government water departments in the USA and Germany to test the quality of the water. Whether this is humane or not is debatable; the point is that an elephantnose needs to be added to a fully cycled, mature tank. Elephantnoses are very timid and nocturnal. A very well planted tank with multiple hiding places in the form of driftwood, pots and pipes is a must, otherwise your elephant nose will be very stressed. Soft gravel is also necessary, so they don't damage their sensitive noses. Hobbyists have reported that these fish only swim in the open when all lights in the room are completely off, yet others say that their fish are very active, and will swim around their owners' hands during water changes, so it's sort of hit or miss. The fish will be much more friendly, however, once comfortable in its surroundings. One tip for viewing your elephant nose during the day is to purchase some see-through plastic pipes, and put a few plants in front. That way the elephantnose can feel secure, and you can view them. Elephantnoses are a member of the Mormyridae family, or electric fish. They emit small electrical pulses from an organ located inside their nose. The pulses will change with the mood of the fish. Female elephantnoses have shorter pulses, males longer. They also have very poor eyesight, so this organ helps them navigate around the tank. This slight electricity should not hurt the other fish in the tank. Care Level - Medium/ Difficult. This fish needs perfect water and is somewhat intolerant to medication. 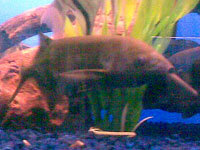 Origin / Habitat - They are native to the slow, murky waters of Africa, mainly around Niger. Temperament / Behavior - Peaceful, but cannot be kept in pairs because the weaker one will be harassed. If you want to keep them in groups, they need to be in 5 or more, so the aggression will be spread out. Tank Mates - Anything peaceful, it will not be able to compete for food otherwise. Tetras, angelfish, gouramis, etc. They have also been successfully kept with discus. Breeding - Very difficult to breed in captivity. Studies have shown that when introduced into aquaria, the electrical organ that is used to find food can get reversed from male to female, making it impossible for even the fish to tell the gender of their tank mates. Fish Disease - No major diseases that they are susceptible to, but they can be sensitive to even basic medications, so great caution should be used, and instructions read carefully when treating. Feeding / Diet - They are primarily scavengers, who sense food with their nose, then bring it to their mouth, much like real elephants, except that the mouth is above the trunk, rather than below. They love brine shrimp and Bloodworms, frozen or live, but will rarely accept flakes. Gender - Impossible to tell without dissection.